The 20th Anniversary Tour of ‘RENT’ visits the Buell Theatre from Nov. 14-21. Photo by Carol Rosegg. 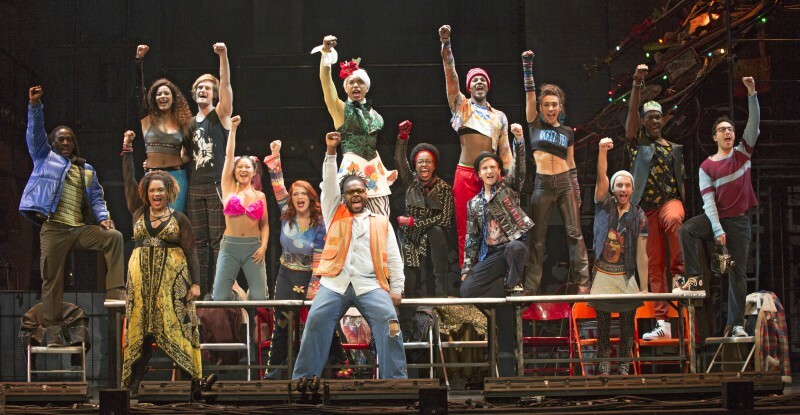 When we think of RENT, we think of the ’90s. Yet it hasn’t become a period piece. Audiences are still coming. Musicals are time capsules. Oklahoma! recalls what we were fighting for in ’43; Hair shows what we were fighting for in ’67; A Chorus Line mirrors the anxieties of the ’70s; The Phantom of the Opera captures the gilded ’80s. When we think of RENT, we think of the ’90s. Yet it hasn’t become a period piece. The music still sounds like today and the story sounds like a storm warning. The burning question, “How we gonna pay the rent?” echoes the not too distant past. It was a question that was true of New York in the ’90s and one that Jonathan Larson, RENT’s young composer-lyricist, often asked himself while waiting on tables in SoHo. When somebody proposed he write a campy uptown version of La Bohème, Larson decided instead to set it in the East Village and to take his characters as seriously as Puccini had. The result was the megahit that every Broadway composer dreams of. Tragically, Larson died of an aortic aneurysm just before previews were to begin, as severe a shock as Kevin McCollum, RENT’s co-producer, ever hopes to sustain. Like La Bohème, Rent concerns a band of would-be superstars, not all of them geniuses, toughing out the winter in an unheated loft in the East Village. As members of Generation X, they speak the musical language they were brought up on: rock, pop, soul, salsa, disco, country. “Can’t you do that around here?” Mom and Dad want to say. Instead they murmur, “Don’t forget to call.” Which the kid never does. So the parents do, and get voicemail. Mom’s fake-cheery voice from Scarsdale gets a laugh in RENT, but not a mean one: Larson, a White Plains boy, shares her concern. La vie bohème on Avenue B is hard-core and high-risk. Where Hair once glossed over the penalties of freaking out, Rent deals with them. A music video for “the life,” it’s not. Human, it is. One’s heart goes out to Mimi, the clueless cat-dancer, and to Roger, the out-of-tune guitarist, struggling to come up with his one great song (which keeps turning into Musetta’s waltz from Bohème). Yet hope keeps breaking in. Plus a certain amount of self-dramatization. (I said these were young people.) And true love, of course. (I said it was an American musical.) And a terrific score. RENT may not have been the first big step that the rock musical had taken since Hair — we can’t forget Jesus Christ Superstar — but it was the most propulsive musical to surface in a long while, fired not only by the energy of the young, but by their desperate need to make their lives happen before they ran out of time. The intensity of the emotion does not swamp the ship. “Mindless,” the usual synonym for rock musicals, won’t work for this one. If Larson’s tunes sound like the Top 40 fare his kids grew up on, he wrote them as a theatre composer, with careful attention to character and situation. Meanwhile his lyrics have an ironic edge that keeps the show from whining. It wasn’t that simple, of course. It got very complicated after Larson’s sudden death just as the show started previews in the winter of 1996. It left McCollum and Seller with an unfinished show. Larson’s score was amazing, his characters alive, but the story still needed sorting out. A solution was proposed: Incorporate Larson’s stage directions into the dialogue. The device helped to clarify what the characters wanted — not perfectly, but well enough — and McCollum wasn’t about to apologize for it. Thousands of performances later, they’re still coming. The RENT 20th Anniversary Tour visits the Buell Theatre in Denver from Nov. 14-21. Dan Sullivan directed the Eugene O’Neill Theater Center’s National Critics Institute and reviewed for the Los Angeles Times. At a glance: This Pulitzer Prize and Tony Award-winning masterpiece returns to the stage in a vibrant 20th anniversary touring production. With its inspiring message of joy and hope in the face of fear, this timeless celebration of friendship and creativity reminds us to measure our lives with the only thing that truly matters. Jasmine Easler, left, and Lyndie Moe. Photo by Carol Rosegg.